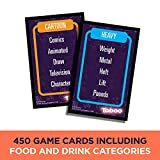 This exclusive edition of the taboo game comes with 450 game cards -- including food and drink category cards -- for even more unspeakable fun! 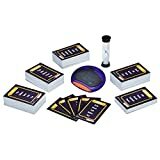 The aim of this fast-paced, laugh out loud game is for players to get their team to correctly guess the guess word listed on the game card. 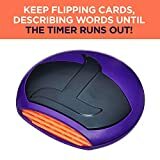 If the describer says a forbidden word listed on the card while giving the clues, they'll get interrupted with the electronic buzzer and lose a turn. 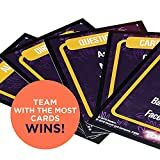 Players keep the cards that were guessed correctly, and the team with the most cards wins the game. 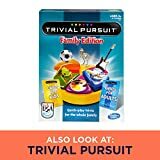 It's a great party game for players ages 13 and up. hasbro gaming and all related terms are trademarks of Hasbro. taboo is a trademark of hersch and company. 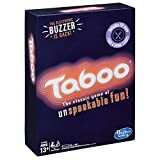 Interested in the Taboo Party Board Game With Buzzer for Kids Ages 13 and Up (Amazon Exclusive)? Is the price too high? You can easily price watch this product and we'll notify you when the price reaches your target.